Preheat your oven to 350 degrees. 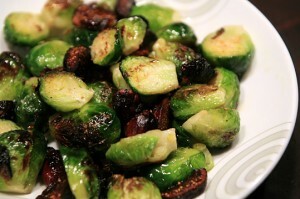 In a medium bowl, add your brussel sprouts and figs. Add a good drizzle of olive oil and season with salt & pepper. Mix to evenly coat. Spread everything out on a baking sheet and pop it in the oven for 15 minutes. Remove and use a spatula to flip; the undersides should be a gorgeous brown color. Place back in the oven and cook for another 5-10 minutes. Remove and serve.